A Cooking Bookworm: Attention Keurig fans! Introducing Ekobrew! Even though he is the only coffee drinker in the house, those K-cups can become expensive. Like probably every other Keurig owner, in an attempt to save money, we've tried all of the other make-your-own k-cup reusable filter devices. We've always been a bit disappointed. Until now. Eko Brands, LLC is a Seattle based company determined to be ecologically responsible in the single-serve coffee segment. 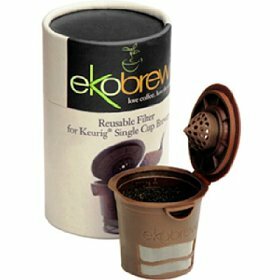 Because of this conviction, the Ekobrew, a reusable filter for use with Keurig single cup coffee brewing devices, was born. Then there's the filter itself. Not only does it look nicer than the other options out there, but it is simpler in (outward) design than the competitors, making it very user friendly! The lid is attached - nothing to lose or hunt through drawers to find or pry off with a special tool. It also fits right into your Keurig as a regular ol' k-cup with no other extra, frustrating steps (such as removing the entire housing for Keurig's own My K-Cup). Our favorite part of the Ekobrew? The fill line! Even though you still need to find the right sized grounds and amount of coffee that will produce a result you like, the fill line took a lot of the guess work out of our initial tests. Past filters were always over- or underfilled and harder for us to get consistent results. You can see all of Ekobrew's great features HERE as well as TIPS for brewing with your Ekobrew. A top reason you likely love your Keurig is not having to deal with the measuring and disposing of messy coffee grounds. 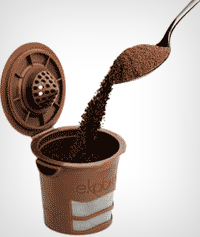 BUT...if you're wanting to save money, reduce waste, or use your favorite coffee that hasn't found its way into a k-cup: I recommend the Ekobrew. Thank you to Ron from Ekobrew for sending me a filter to review!